01 Feb 2019 --- Heart health is undoubtedly a pressing issue globally, but this is perhaps especially the case in the US. A new American Heart Association (AHA) Heart and Stroke Statistics report has shown that 48 percent of Americans suffer from some type of cardiovascular disease (CVD). The AHA report’s release coincides with a new Cleveland Clinic survey that says that while 90 percent of Americans understand that regulating body weight is beneficial to heart health, they do nothing to actively tackle weight issues. The root of the issue, according to the survey, may also be that Americans do not know what to eat for better heart health. The researchers are calling for the public to reach out to health professionals to combat weight issues, which could, in turn, prevent the rise of CVD. Cardiovascular disease includes conditions such as coronary heart disease, heart failure, stroke and high blood pressure. “People seem to abstractly understand that obesity is ‘bad’ for your heart and your health, but they are not connecting the serious health conditions that it’s linked to, such as coronary artery disease, stroke, high cholesterol and even some forms of cancer. If people better understood the link, we may be able to better motivate them to take action to improve their health,” Dr. Leslie Cho, Head of Preventive Cardiology at Cleveland Clinic, tells NutritionInsight. AHA’s updated 2019 Heart and Stroke Statistics were published in its journal Circulation and it includes data gathered in conjunction with the National Institutes of Health (NIH) and other US government agencies. The report showed that despite years of steady decline, CVD rates in the US are again on the rise. Unhealthy diets and sedentary lifestyles drive up blood pressure, according to the AHA report. CVD remains a leading cause of death globally and emerging data increasingly links it to high blood pressure, highlighting the correlation between excess weight and poor heart health. According to the US Centers for Disease Control and Prevention (CDC), nearly 40 percent of Americans (93 million) are obese and even more are overweight. “As one of the most common and dangerous risk factors for heart disease and stroke, this overwhelming presence of high blood pressure can't be dismissed from the equation in our fight against cardiovascular disease,” says Ivor J. Benjamin, M.D., AHA Volunteer President. “Research has shown that eliminating high blood pressure could have a larger impact on CVD deaths than the elimination of all other risk factors among women and all, except smoking, among men,” he adds. As well as lowering blood pressure, healthy behaviors such as a healthy diet, remaining physically active and maintaining a healthy weight are important in preventing approximately 80 percent of all cases of CVD, according to the AHA report. 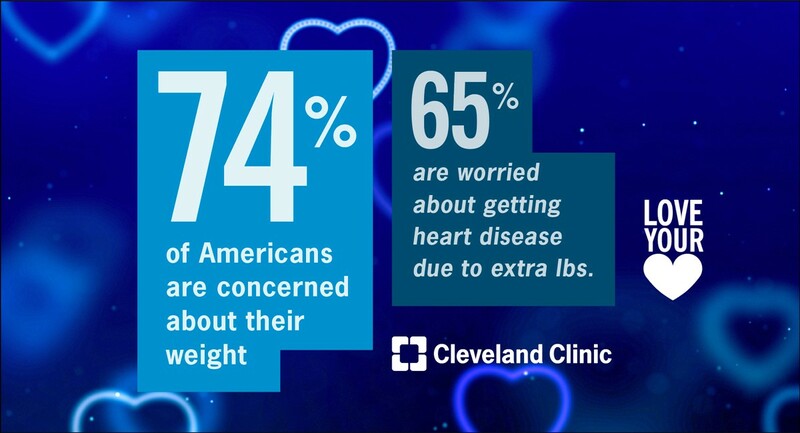 This is supported by the Cleveland Clinic survey findings, which say that Americans fail to understand the impact excess weight has on their heart and overall health. “Many Americans live busy, but sedentary lifestyles that don’t prioritize being active. We need to better educate the public about the specific health consequences of carrying excess weight and the benefits of losing weight,” Cho tells NutritionInsight. Click to EnlargeRoughly 90 percent do not link obesity to cancer or atrial fibrillation. More than half of Americans also don't know that obesity is linked to high “bad” cholesterol levels (54 percent) or coronary artery disease (57 percent) and two-thirds (64 percent) don't know it can lead to a stroke. 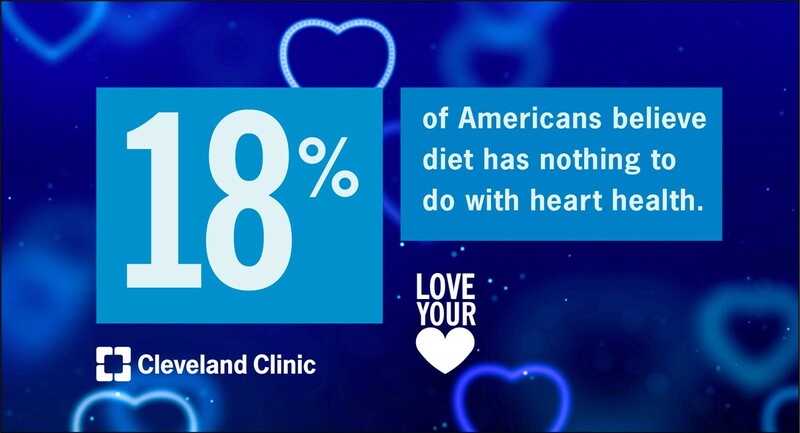 The survey was conducted as part of Cleveland Clinic's “Love your Heart” consumer education campaign in celebration of American Heart Month and included 1,002 adults 18+ years of age, living in the US. Additionally, the survey found that 74 percent of Americans are concerned about their weight and 65 percent are worried about getting heart disease due to the extra pounds. Despite this, less than half of Americans (43 percent) have tried to make dietary changes to lose weight and 40 percent of those who describe themselves as overweight or obese say they aren't careful about which foods they consume. The root of the issue, according to the survey, may be that Americans do not know what to eat for better heart health. 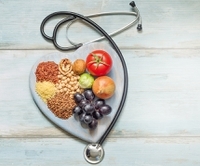 Nearly 18 percent believe that their diet has nothing to do with their heart health and a mere 14 percent know that a Mediterranean diet may be beneficial to heart health. Moreover, nearly 46 percent of Americans believe using artificial sweeteners is a healthy way to lose weight despite studies showing they don't promote weight loss, the survey found. Click to Enlarge“We need to do a better job of educating patients and the general population on the benefits of a healthy weight. A patient only needs to lose 5 percent of their body weight to start seeing important health benefits,” says Steven Nissen, M.D., Chairman of Cardiovascular Medicine at Cleveland Clinic. Additional findings showed that 84 percent of Americans say they have tried at least one weight-loss method in the past. 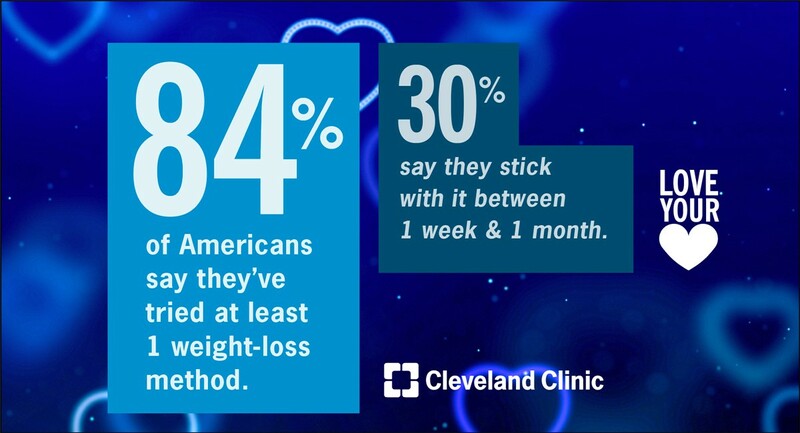 About one-third (30 percent) say they typically stick with it between one week and one month. Americans cite dislike of exercise (24 percent) and lack of time (22 percent) as their main barriers to maintaining a healthy weight. Most Americans also believe their metabolism is detrimental to weight loss. A notable 60 percent of women and 46 percent of men say their metabolism is working against them. Experts urge people to seek medical advice when wanting to regulate weight, but the public reportedly feels apprehensive about it. Despite 44 percent of Americans saying they are most likely to turn to their physician for nutrition advice, only a quarter (28 percent) have told their doctor they would like to lose weight. Even less (22 percent) say they have discussed heart health in relation to their weight with their doctor, the survey finds. “Weight is a very sensitive and complex issue for many people. One problem is that there is a lot of misinformation about diet, wellness and exercise in the public that leads to confusion. Because of this, many people may get frustrated with their efforts or avoid starting a weight loss program in the first place,” notes Cho. “Obesity is a steady problem in the US and we know that there is an education gap when it comes to public understanding of weight and how it affects health. This survey really confirms some of the confusion that we see with our patients in the office about not only weight but diet and exercise,” she says. The researchers suggest the knowledge gap is bridged by people talking to their doctors about their weight issues. “You can start by asking if you are at a healthy weight,” Cho muses. “Your physician can help you develop a steady, long-term weight loss plan that is sustainable. They can help you understand the foods that will benefit you and the types of exercise that are right for you. Adapting a healthy lifestyle, as opposed to trying to ‘diet,’ will help reduce your risk for heart disease and related conditions,” she concludes.